Three years of research have led a team of French engineers to produce their interpretation of wind energy for urban locations. The Wind Tree stands at 26 feet tall, and its branches adorn the Pleumeur-Bodou commune in Brittany in northwestern France. Hit the jump to learn more about this new breed of silent wind turbine that turns energy production into an art form. Jérôme Michaud-Larivière, the founder of the company New Wind, says that “The idea came to me in a square where I saw the leaves tremble when there was not a breath of air.” He went on to hypothesize that the energy “had to come from somewhere and be translatable into watts.” Other turbine ideas have hit the headlines, but the wind tree is the first that fully integrates form and function rather than being an add on. 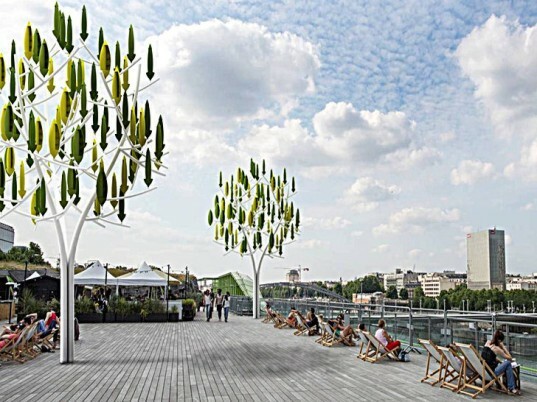 The Wind tree will be on display in Paris Place de Concorde in May 2015. The Wind tree uses tiny blades that are housed in the leaf units. The blades turn inwards, which enables the units to turn in the wind, regardless of wind direction. Jerome told Microsoft the units respond to wind as low as 2 meters per second. The units are silent, which is a bonus, as other wind turbine technology can be very noisy and unsuitable for urban areas. 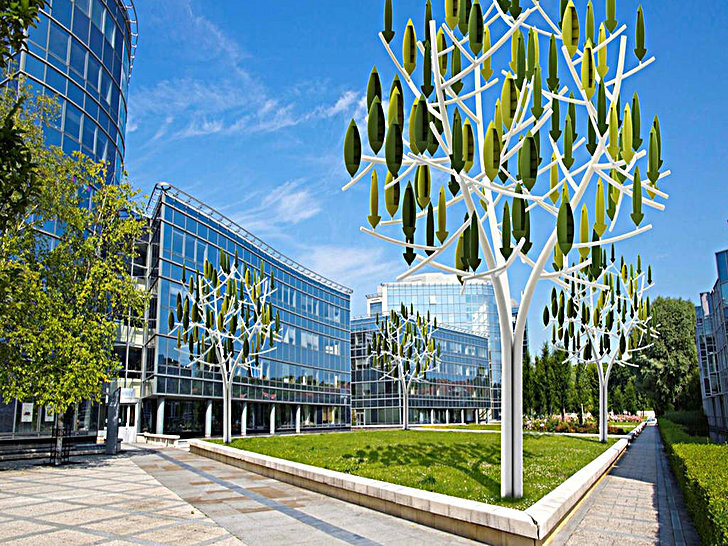 The team therefore claim the wind tree is less obtrusive than other designs and could be used in many locations such as gardens, squares, parks and shopping centers. The units will cost around £23,000 and can be linked together. Since they look like sculptures, the trees could be used as street art that also powers the city. I would like to know more about this and do you have some in the USA. Do you have some here in the USA We have been thinking of doing some thing here we have a good place to have some thing like that. Brilliant! Someone must open a company in California's high desert! Thank God France has Nuclear Power! The manufacture of this work-of-art may be nearly carbon-free as long as they don't import any parts from High carbon economies like China or Germany. There is no way this statue is every going to make enough power to run a toaster oven. But it is better looking than most of the modern public art. Climate collapse is a serious problem. We cannot pin our hopes to Disneyland style fake trees. WE need to update nuclear power from the half century old WWII LWR designs. Only with nuclear and solar and wind can we hope to PREVENT climate collapse by getting back to 350ppm CO2. I love this idea. I would love to be involved in selling them for you in the US.. The technology looks nice – but are there any numbers regarding potential output?50W? 1KW? How does it stack up compared to conventional wind turbines or solar power, esp. looking at the “artsy” price tag? you could also use light as energy source at the same time by coating the leaves. The technology looks nice - but are there any numbers regarding potential output? 50W? 1KW? How does it stack up compared to conventional wind turbines or solar power, esp. looking at the "artsy" price tag? could a tree power a 2000sqft household? Wind tree wind turbine leaves in a park.